About two and a half years ago, Laura took on the Wolverine mantle after her father, Logan, died. Although Marvel could have handled her taking the mantle a lot better, like having her in at least one team book instead of throwing Old Man Logan everywhere, there’s been at least one consistently good element to all this. The All-New Wolverine series, written by Tom Taylor, has been consistently good. It’s done a brilliant job at balancing action, drama and fun. It continued Laura’s development as a character becoming more independent and responsible than before. Today’s issue concludes this series. 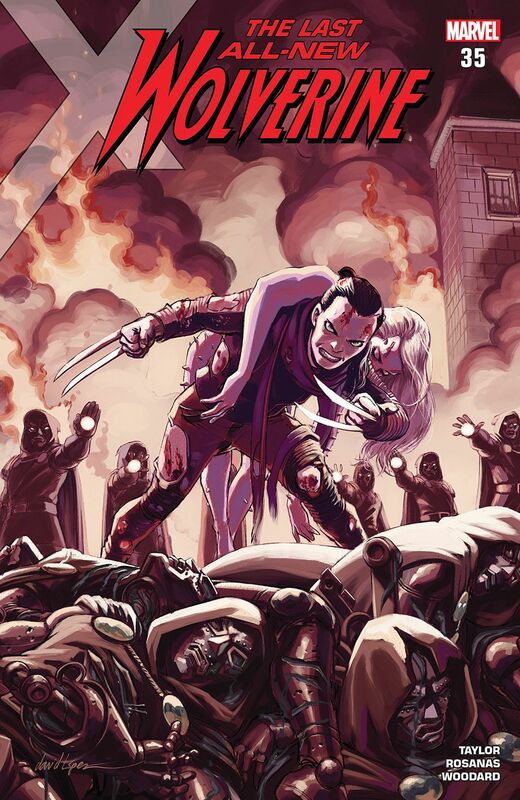 All-New Wolverine 35, the final issue, is also the third part of the Old Woman Laura story arc. This series isn’t without its flaws. For one, as the series went on, it almost became too much about Gabby and not enough about the title character at times. Several story arcs felt a bit too short for their own good, either with the conclusion feeling rushed, or not enough room for the kind of drama that propelled its story from good to great. Most notably for this would be Enemy of the State II, which felt like it needed either an extra issue, or a double-sized issue to wrap everything up. Unfortunately, Old Woman Laura suffers from the same problem. Don’t get me wrong, this is a good comic. It’s unique among the alternate futures in that things actually turn out well. Most of the villains are dead, and besides Latveria (still ruled by Doctor Doom), the world is at peace. A flaw in her original cloning has left Laura dying, despite the fact that her abilities should make her live for centuries. With a touch of her fatalism from her earlier years coming back, she decides to go on one last mission. To kill the world’s last remaining supervillain. It’s fun how both Laura and Doom have their plans in the works, as if they knew this conflict would come eventually. As much as they don’t share too many pages together, nothing about their “fight” feels rushed. There’s enough room to express everything from a dramatic standpoint to the visually told story that I’ll expand on later. The comic also wraps up nicely with Gabby giving Laura words of encouragement, echoing the final page in the Three Sisters story arc that kicked this series off. It’s a great note to end this series on. Where this comic feels rushed is pretty much everything else. Gabby leads a small team to infiltrate Doom’s prison, where a bunch of heroes thought to be dead are sitting in cells. With several more issues, this could have easily turned into an epic fight between a bunch of superheroes and Doom’s army of bots. Even if that only happened in a couple of background panels, that would still be awesome. We also see Gabby and Bellona reuniting after decades. Decades where Bellona was captive one way or another, and Gabby didn’t know anything about her clone sister’s whereabouts. They share a total of 2 lines and 10 words together. Laura barely has time to speak with her either. And with Bellona speaking so softly with her words, she doesn’t feel anything like the unstable killer she was earlier in the series. Even one extra issue could have added a lot to their reunion. This would probably be more Marvel’s fault for not giving Taylor one more issue than they did than it is Taylor’s. Anyway, Ramon Rosanas’ art is fantastic. At first glance it’s a simple, clean look. Yet there’s plenty of detail in the backgrounds, from Doom’s old castle complete with scattered rocks on the ground, to the streets where worried people watch as Laura picks up Maria Hill’s body. The best part of the comic from an art perspective is when Doom and Laura have their fight. It’s a mental fight, with Doom trying to take Laura’s body for his own, leaving behind his old, decaying body. It shows both of them in a silhouette, with Laura growing as she clearly starts winning the mental war, having survived through far more pain than Doom can hope to dish out. Along with the script, it’s a brilliant moment that shows the incredible inner strength Laura’s developed over the years. By extension, Nolan Woodard’s colouring is also fantastic, like it’s consistently been through the entire series. Despite my complaints about this issue’s story feeling rushed, it does end All-New Wolverine in a satisfying way. It feels like a celebration of the series as a whole. It would just be a more thorough and emotionally satisfying conclusion with more space to focus on Bellona’s reunion with her sisters. And perhaps a more drawn-out fight scene with Doom’s forces. I wouldn’t recommend Old Woman Laura to those who haven’t been reading All-New Wolverine, but it’s worth picking up for those who have. And this series as a whole is the best X-Men title to come out in years – possibly since Kieron Gillen’s stellar Uncanny X-Men run, even if it is technically a solo book. This entry was posted in comics and tagged all-new wolverine, bellona, comic review, comics, doctor doom, gabby, honey badger, latveria, laura kinney, maria hill, marvel comics, marvel legacy, nolan woodard, old woman laura, ramon rosanas, tom taylor, wolverine, x-23. Bookmark the permalink. It’s a solid finale to a great series. Giving it a few extra pages probably would’ve been worth doing, even if it bumped the price up. (The best option would’ve been a few extra pages at no extra cost, but this is Marvel.) I don’t think it needed an entire extra issue, but a few extra pages, yeah.